Take Your Pick: NEW Homegrown Recipes! We hosted this year's first homegrown cooking class in our new cooking classroom on Thursday! Guests were treated to a variety of recipes featuring this season's freshest produce. We thought we would share some of their favorites with you! Layer the tomato slices on a rimmed platter. Salt. Top with thin slices of red onions. Sprinkle sugar across latter. Top with peach slices. Drizzle olive oil. Drizzle withe cider vinegar. Top with mozzarella balls. Serves 4. Place lime juice and honey in a saucepan over low heat or on the side burners of a grill. Bring to a boil and let boil for 2 minutes. Remove from the heat and allow to cool. 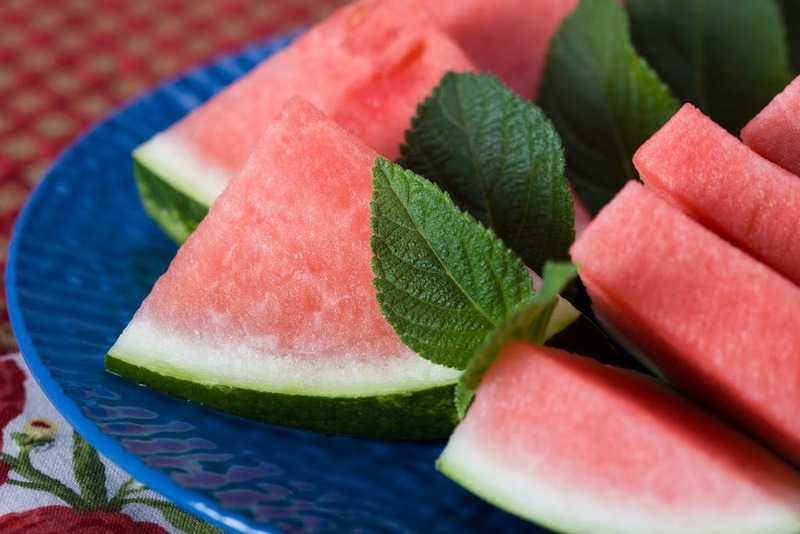 Place watermelon slices on a large platter and drizzle with the lime syrup and garnish with mint. Preheat oven to 400 degrees. Combine sugar, flour and salt in a large bowl and mix. Stir in fruit. Spoon into a greased 8x8 pan and bake for 15 minutes. To prepare topping, pour 1 1/3 cup flour, 1/3 cup sugar, baking powder and salt in a food processor: pulse to combine. Add pieces of butter and pulse until it resembles a coarse meal. Pour in buttermilk and pulse until just incorporated. Remove fruit from oven and top with irregular spoonfuls of dough. Place baking dish on a rimmed pan. Return to oven for 25 minutes or until golden brown and bubbly. Serves 6. Peaches and blackberries are still ripe for the picking at the Belleville and Grafton farms. Stop by soon and take advantage of our Sale of the Season on homegrown tomatoes... only $.79/lb!! !